While you're being teleported in the cloud of blue smoke that Starswirl made, you can hear him talking but you can't make out what he says. Luna responds and she sounds a bit distressed, but the whirling smoke distorts her words as well. Careful not to wander around in case you fall out of the spell, you remain still until the cloud dissipates. Warm sunlight pours over you, marking your third day here in Equestria. It was night when you came to Starswirl's mansion, so you must have been there longer than you thought. The sight of everyone's smiling faces greet you as you look around your new environment. There's tall fields of grass and rolling hills as far as the eye can see and not a single building or tree in sight. If this is where the city of Taloran is supposed to be, then where is it? At least a few hundred troops have made camp here. Gold Heart is making sure everyone is doing what they're supposed to be, but Thorn is nowhere to be seen. You wonder if he even made it here after the outburst that Tiamat made him go on. Lucent and Baron join the rest of the encampment leaving you, Starswirl, Luna, and Celestia behind. Luna doesn't look too happy right now as she's not facing anyone and Starswirl and Celestia are greeting each other warmly. Those two must have some stuff to catch up on. Little reminder that all dice rolls made are to be d100 and I'll let you know what you have to make to succeed in whatever roll. I'm pretty sure its the key we used at the crater, which turned it into a portal to Earth's dimension. You move in closer to listen in on the conversation and Luna watches you. "Business as usual with the dragons, eh?" Starswirl hmphs. "You'd think they'd be happy to have some help after being abandoned by their own people, mind control or not." "You know how prideful they can be, Starswirl," Celestia reminds him. "They've already sent someone down to inform us about the current situation in the capital. Despite the disappearances, they don't want it looking like anything is actually going wrong." "And why not?" Starswirl says. "The more control we can assert here, the better for both parties involved." "I agree," Celestia nods, "but we mustn't raise a panic in the remaining population, dragons or ponies." "The dragons already know what's going on," Starswirl grimaces. "There's nothing for them to worry about aside from what they already know." "Apprently, only Emperor Halberd and Pierce, his advisor, are the only ones who actually know what's going on," Celestia says. "Aside from the disappearances, it's business as usual in Taloran. And even if the dragons knew, we can't have the ponies running around in a panic." Luna is staring off into the distance again, watching the camp while Celestia and Starswirl converse. You examine the key, but it's not doing anything strange. You return in to your pocket. You also realize your shirtless. All this time and you never bothered to ask about getting a new shirt after you threw the last one to the manticore back at the Forest of Leota. Oh well, at least the weather here is nice enough. You'll have to get another sword and shield too. Ask Luna if everything is fine, she seems a bit distracted. I wonder why the other dragons don't know what's going on, if I remember correctly Tiamat spoke directly to Thorn, you'd expect she did the same to the dragons in Taloran. You move over to Luna and ask if everything's alright. "If you remember," Luna says, "Starswirl said that he suspected you of having something to do with Nightmare Moon's appearance. He has told us… me that he will tell Celestia about what happened if we do not." As much as you two could keep that little secret under wraps, it doesn't mean much if Starswirl also knows. And if he plans on telling Celestia, it might be a good idea just to come clean about the whole thing and save yourself some trouble later. But if Celestia ends up having to throw Luna back in the moon again for another thousand years, it could mean bad times ahead for everyone, especially since Luna is needed to form the Chains of Harmony, along with Celestia and the Elements of Harmony. "I don't think we have much of a choice in that case - better we tell Celestia what happened before Star Swirl does. He didn't seem to be a big fan of me anyway"
"Maybe we should tell her," you suggest. Luna looks up at you, surprised by your answer, and says, "You know what this could mean and yet you still wish to tell her the truth?" You had promised to keep a secret for her, but if Starswirl is going to tell Celestia anyway, there's really nothing you can do, save for getting rid of Starswirl somehow, but you doubt that would be an easy task. "He is a strict and cruel old unicorn," Luna frowns, "but like my sister, he has always done what he thought was best." Luna takes a deep breath and there's a long pause as she looks up towards the sky. "I will tell her once we are safely in the capital," Luna says. "We must be in harmony in order to form the chains and we can not have secrets like this between us." Luna's not the only person that Celestia is going to have to talk to once you get to the capital. You and her are supposed to have a talk as well, but seeing as how you two haven't gotten along very well since the Badlands, it's probably not something you're looking forward to. You kneel down before her and wrap your arms around her neck. She leans forward into your hug and rests her head on your shoulder. You can feel her soft coat against your skin and the cool sensation of her mane tickling against your cheek. "I know you will be there with me when the time comes," she smiles. Wait, how tall are the Princesses again in comparison to us? Ask her if she wants us to come with her when she explains what happened to Celestia. You're eye to eye with Celestia when standing. The top of Luna's head reaches the bottom of your chin, if I remember correctly. "You really want me to come with you?" "Of course I do," Luna steps back and smiles at you. "I could do it alone, but I would rather have you there for support. Don't tell me you fear my sister so much that you can not face her unless you are by my side?" "I think I can handle her. Though she can be kinda scary when she wants"
Look around if we can spot Goldheart anywhere. Before we reach the city there isn't much to do anyway so we should probably use the chance to restock our equipment. Luna laughs and says, "I do not disagree with you, but there is a reason I am the focus of Nightmare Night." You look around to see if you can spot Gold Heart anywhere. When you first came out of the smoke, you saw her in the camp, so you say your farewells to Luna and head through the tents. The last time you saw Gold Heart was before the attack. She was riding on Thorn when he started to go ballistic and destroy everything around him with his flaming breath. It's a miracle she survived that. She seems fine if she's hard at work again, but the last time you saw Gold Heart upset, she had done the same. Tears the night before and silent diligence the morning after. With Thorn nowhere in sight, you have a good reason to be worried about her. You were the one who suggested that you leave Thorn behind when he first started hearing Tiamat's voice, so it might be best to approach her with caution. You've been on her bad side before and it wasn't a pleasant place to be. You spot Gold Heart taking inventory at the armory tent. Perfect for you since you needed a new shield and sword anyway. She seems rather focused, but for a brief moment, she sets aside her clipboard and sighs. I guess its best to wait for her first reaction before we decide what to do next. "Hey Gold Heart" you wave at her. Gold Heart looks up at you and raises an eyebrow. "I'm glad you're still alive," she says, "but what happened to your shirt? And what happened to all of your equipment?" "I.. uh.. I had to fight a Manticore and lost it in the battle?" "A manticore, huh?" Gold Heart says and sets the clipboard aside. "If you can handle that I guess you don't really need me training you anymore. Hard to believe that once was really enough. You humans are strange." Gold Heart rummages through the stacks of weaponry and finds you a sword and a shield. Once again, both are smaller than what you should actually be using, but at least you have your weaponry back. You keep the sword and shield at your waist with the belt they came with and secure it. "We'll be heading to the capital shortly," Gold Heart informs you. "Thorn will be meeting us there and I want you on your best behavior if you're going to be dealing with other dragons. As much as I know you'll ignore it, I'd advise against talking to any of the dragons while we're there. Just stick to ponies and you should be fine." "Don't worry, I didn't plan on duking it out with any more dragons than I have to - Tiamat is more than enough." "I think I could still profit from your training. I mean, after all I lost my weapons during the.. encounter. Not optimal." "Don't worry, I didn't plan on duking it out with any more dragons than I have to - Tiamat is more than enough," you say. "I think I could still profit from your training. I mean, after all I lost my weapons during the.. encounter. Not optimal." "No," she says. "It's not the best situation to be in, but you seem to have handled it well enough. Everyone is alive and well, and that's enough for me. I assume the others are waiting somewhere around the camp? We'll meed to discuss a few things before we leave about the situation in the capital and how we should proceed, unless the princesses have already briefed you?" >unless the princesses have already briefed you? "No, Celestia was busy talking to Star Swirl when we arrived, she didn't have a chance to fill me in on what happens next yet." "Very well then," Gold Heart says, brushing a few strands of her golden mane out of her eyes. "We are currently beneath the Dragon Empire's Capital City of Taloran. The entire city has been cloaked with magic and floats in the sky above a larger area beyond the eastern edge of the Prancing Plains." She steps out of the tent and motions you to follow her outside. "As I've stated," she continues. "Thorn is currently in the capital, preparing everything for our arrival and gathering as much intel as he can. From what Emperor Halberd and his advisor, Pierce, have told us, once Tiamat made some of the dragons disappear from the city, things went quiet. She hasn't made a peep since." A pegasus soldier flies down with a clipboard and Gold Heart checks off something with a pencil before continuing. "The Emperor believes that Tiamat may be focusing on spreading her worldwide influence rather than keeping everything contained within the capital. This would explain Thorn's rampage and the attack we faced at the Forest of Leota. What has us all worried, is that with such a wide net of control over the other dragons, we could be facing an even larger scale assault here on the capital. The Emperor has sent word out to other dragon colonies for help, but he doubts they will heed the call. Even worse, we can't have the citizens in a panic so we'll be keeping everything under wraps." Baron and Lucent pass you by loaded with supplies for the camp. Baron gives you a nod in greeting and Lucent waves, almost dropping her load in the process. Gold Heart doesn't miss a beat in her speech. "The ponies are not to know that we're planning a counter assault and the dragons are under enough stress as it is. Panic creates tension, tension creates conflict, and conflict leads to unnecessary loss on our side. The dragons are doing what they can to help, but the minute everyone sees Equestrian soldiers marching through the streets, we have a problem." Luna, Celestia, and Starswirl are waiting for you at the edge of the camp. Luna and Celestia seem to be in good spirits, but Starswirl is eyeing you with contempt. No doubt he still thinks you're hiding something. "So, our mission here is to appear as nothing more than a simple visit," Gold Heart continues. "A simple get together to see how ponies are faring in the city and keeping up good relations with the dragons. Baron and Lucent will be joining us as soon as they are finished with the supplies as well as two of Celestia's guard. Understood?" Slam your heels together and salute. "Yes, si- er, I mean, madam!" "Yes, si- er, I mean, madam!" you say, slamming your heels together in a salute. Gold Heart rolls her eyes and meets up with the rest of the group. There's a load roar from above and you see Thorn flying down with the biggest chariot you've ever seen. The whole thing is made of solid gold carved into ornate imagery of dragons in fierce battle with one another. He lands before all of you and smiles, tucking his wings to his side. "Oh, Thorn, what did they do to you?" Gold Heart complains as she prods at the chains that attach him to the chariot. "I can't believe they're going to make you carry us up there. You are a dignitary as much as I am and deserve better than this." "I chose this," Thorn tells her. "You should have had that blundering idiot Pierce bring us up," Gold Heart says as she climbs onto the plush, red cushioning of the chariot. "Hey!" you hear Lucent from behind you. "Don't leave without us." Lucent, Baron, and two of Celestia's guard are running towards you. While the rest of them take their positions on the chariot, Lucent stops before you. "We're probably not gonna get a lot of time to talk with me working," Lucent says, scratching her hoof at the ground, "but what do you say we do something fun tonight after I'm finished with my boring guard duty stuff? I've never been to the capital before and I'd really love to check it out." "I don't know what's on my to do list for today yet - but if my evening is free, sure!" Unless someone else is against it of course.. I guess A.J. could be cruel and present us with the opportunity to hang out with Luna instead later on, when we already promised Lucent we'd do something with her. "I don't know what's on my to do list for today yet - but if my evening is free, sure!" Lucent beams flies up into the air before you. "Great," she says. "I know we're supposed to be saving the world from Tiamat, but she's not here yet and the princesses have got everything under control, so why not have a little fun why we patrol the city?" "Lucent!" Baron calls to her from the chariot. "Coming," she winces and flies over to take her spot. You watch her go and see that Luna is still waiting outside of the chariot for you. Celestia and Starswirl are patiently awaiting the both of you. "Come," she says your name, "I insisted upon you being with us on our journey to the capital and I do not intend to leave you here." Then shall we be off? Poor Thorn having to carry all of us. "Then shall we be off?" Luna climbs aboard the chariot and you follow her aboard, take your seat next to her across from Celestia. Thorn spreads his wings and takes off into the sky. You can barely hear the wind rushing past you despite how fast you seem to be moving. In fact, you can barely feel the chariot move at all. If it weren't for the change in scenery you wouldn't be sure you'd gone anywhere. The sky around you is filled with bright and fluffy white clouds while the sun shines brightly in the sky. Everyone is rather quiet with the exception of Lucent, who is quietly humming some random tune while she stares out of the chariot. "Excuse me," she speaks, "but where is the capital? Aren't we supposed to be right next to it?" "We are," Gold Heart nods. "Found a good place to land yet, Thorn?" "Yes," he says, his deep voice vibrating through the chariot. "Take us in, please," Gold Heart says with a smile. "A few days is too long to be gone from home." With a tilt of the chariot, Thorn turns into another area of open sky and flies straight. You don't see anything on the horizon, and then a bright glare blinds you. You adjust your eyes and look upon the largest city you've ever seen. Completely golden structures built as tall as mountains stand before you on a floating island in the sky. Tropical trees and waterfalls course through the city on natural formations that make it look like the city grew out of it, rather than the other way around. The shine from the sun almost makes it difficult to look at from this high up until Thorn takes you down into a shadier section of the city. A golden ledge sticks out over the open air, connected to the city, and Thorn brings you down over it. Everyone begins to get out of the chariot and Gold Heart mentions that Thorn will meet up with them later. You step onto the golden bricks that make up the road into the city and small, dark blue dragon walks up to greet you. He's small compared to Thorn at least, but he's a good three or four feet taller than you, and standing on his rear legs. Long spines taper off to one side and his tail always manages to stay curled up just a little past his talons when he walks. "Welcome home, Ambassador Gold Heart," the blue dragon greets you with a smile, his voice cheerful and strong. "Save me the formalities Pierce," Gold Heart's face scrunches like she's just stepped into an awful smell. "You disgusting lizard." This confuses you a bit as Pierce has wings that look perfectly capable of flight. Your best guess is that lizard is some sort of insult, as Pierce's expression seems to have sunk a bit. "As wonderful as ever," Pierce clears his throat and turns to you. "What is that?" Slightly bow down and peek over to Gold Heart and Luna to see if they give us any warning looks. If not, I guess its time for a short introduction. You bow down a little before Pierce and give Gold Heart a cautious glance. "Don't worry about him," she says to Pierce, then turns to you. "And stop bowing. He's not deserving of it and you're more of a decent being than he'll ever be." "I would ask that you keep your malice towards me at a minimum during these trying times, Gold Heart," Pierce puts his claws behind his back. "Our dear Emperor is weak with worry and there's still much we have to do in the way of preparing the Chains of Harmony." The Elements of Harmony are currently looking around the city excitedly. You hadn't even seen them get on the chariot. "Bring us to him," Gold Heart says, stomping her hoof. "As you wish," Pierce bows to her and leads the way through the streets of Taloran. Luna walks beside you while Celestia speaks with one of the Elements, Twilight. Lucent keeps wandering off in some direction or another before Baron has to reel her back in with his magic and Starswirl is speaking to Pierce about the state of affairs within the city and how the Emperor has been. "What dost thou…" Luna pauses. "I am sorry. This is one of the few places that has not changed since my banishment and being here has caused me to reminisce. What do you think of this place?" Looking around, you can see ponies happily playing in crystal clear streams that run through the streets in places. Some of them shopping, others having lunch, and a few just relaxing beneath the shade of a tree. Many ponies have homes here, you realize, but you've only seen a few dragons. Most of them soaring through the sky and not too many roaming the streets, like Pierce. "I'm surprised by how many ponies seem to be living here. Isn't this supposed to be the dragon's capital? And how do they even keep this place afloat?" "It does look pretty impressive and peaceful though." "I'm surprised by how many ponies seem to be living here. Isn't this supposed to be the dragon's capital? And how do they even keep this place afloat?" you say. "Ponies have been living here for many years, even before Tiamat," she tells you. "The architecture was made by the dragons out of their own hoards to provide homes for the ponies as a sign of peace between our two races. They relinquished something very valuable to us through friendship and we have sworn to protect that symbolically and physically. Their most valuable possession is known as the mind of Glaurumat, Father of the Dragons, and it's magic is what keeps the city afloat." 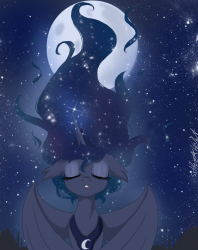 "Yes," Luna nods, smiling at a group of playful colts and baby dragons nearby. "Glaurumat's Mind is the main reason it has to be. Peace and tranquility are what keep the Mind stable." > "Glaurumat's Mind is the main reason it has to be. Peace and tranquility are what keep the Mind stable." "Is Gold Heart aware of that? Her earlier conversation with Pierce sounded like she could bring down this city all on her own. What's her problem with him anyway?" "Gold Heart is well aware of how precious Glaurumat's mind is," Luna says. "Her dislike of Pierce is unknown to me, however. Pierce, and Emperor Halberd, both came into their positions soon after my banishment. You will have to address her on any personal matters." Her eyes brighten as she spots a larger building at the center of Taloran. "There is the royal palace of Taloran," she points out to you. "I am most excited to be staying within its walls once more." It looks massive enough to make even Thorn look like an ant and most of the buildings around here already make him look like a child. It looks more like a church cathedral from your world than a palace until you notice that's just the center. The rest of it is spread out across the island, designed with scales, wings, and horns, that make the palace itself look like an army of dragons rising out of the ground. "Emperor Halberd will be more than happy to have all of you for breakfast," Pierce states. "It has been too long since the princesses of Equestria have visited together." "Have me for breakfast? I taste terrible." This one is good, lets go with that. After how Gold Heart talked to him I don't think making any jokes in his presence is too bad for our health. Gold Heart rolls her eyes, Luna starts to laugh but coughs to cover it up, Celestia smiles, and you can hear Lucent snickering from behind you. "Amusing," Pierce clicks his tongue. "In any case, after breakfast, we will convene in the throne room about gathering the materials for the Chains of Harmony. We've already prepared Glaurumat's Skull for the spell, so we just need everyone in their places." "After we convene, we will do as we please and there will be no protests," Gold Heart snaps at him. "Emperor Halberd will understand that we have had a long journey, much longer than intended, and deserve a proper rest. The princesses must be at the peak of their power to perform the spell and we can't have them running in their half ragged from the journey." Pierce snarls, fangs flashing bright. "We shall see what the Emperor has to say," Pierce says and turns back to the palace. Gold Heart holds a rather smug smile on her face, but the rest of the group seems uneasy about their continuous confrontation. "Perhaps you can speak with her?" Luna suggests. "Find out what it is about Pierce that Gold Heart finds so unpleasant enough to act out." "He seems used to it. That's not how negotiations with dragons usually go?" "Were you not curious about 'what her problem is'?" Luna asks. "The negotiations between dragons and ponies have always been peaceful for as long as I can remember. As I said, peace is important for Glaurumat's Mind. The city would come crashing down without it and no pony would dare disrupt that peace. I feel I must stress the difference between dragon negotiations and a general dislike between a single dragon and pony. Glaurumat's Mind works on a much larger scale. Dunno, I think it would be good to ask Gold Heart what's going on - we certainly don't need any more enemies next to Tiamat. And with her being able to convince other dragons to follow her, it seems like a bad idea to piss them off. "Alright. I'll have a word with her." Well, you're right, I am curious. Any suggestions or other quirks I should know about? As you step forward to catch up to Gold Heart, you feel something hold tight against your foot. A dark green magic aura is holding you in place and it's coming from Baron. "Baron, what are you doing?" Luna faces him. "Release him this instant." "My apologies Princess," Baron says and does as ordered. "I only wish to have a word with him." "Then speak," Luna glares at him. Baron turns to you and says, "Remember what I've told you about watching what you do and say. I don't have any problem with you asking Gold Heart any questions, but I would suggest that you tread lightly. Whatever has Gold Heart upset about Pierce, try and get her to tell you willingly. Don't force the answer out of her or badger her with questions. You remember what she was like when you talked about leaving Thorn behind? You don't want that again." "Your advice is sound," Luna nods and turns to you. "What say you?" "It's good advice. I'll watch my words." "Alright, I'll try to be subtle." Just asking her to tell us something about Pierce is probably the best approach - there's no implication that we disapprove of her behavior or anything like that contained in that question. Maybe we should ask about Halberd first, then use that to segue into talking about Pierce. "Hey Gold Heart, wanna give me a quick rundown on Halberd and his court? Might be useful to know what I'll have to deal with before I encounter him." Well, we should head over to her first. "Gold Heart. You got a moment?" "For?" she says, glancing towards you. "Wanna give me a quick rundown on Halberd and his court? Might be useful to know what I'll have to deal with before I encounter him." "Firstly," she notes, "always address him as Emperor Halberd. He's a very old dragon who has done an incredible amount for both ponies and dragons alike. He's earned that right. And as for his court…"
She pauses, looking towards Pierce. You can see her clenching her jaw for a minute before she relaxes it again to speak to you. "Pierce is the only one you should care to remember as he works very closely to Emperor Halberd," she continues. "He's also a murdering snake and a coward." Her eyes are burning with rage, the dark green of her eyes focused solely on the blue dragon before her. "Enough!" Gold Heart stops herself in the middle of the road. "Go on about your other duties, Pierce, I know the way to the palace. Let the Emperor know I'll be joining him shortly, but I must check on Thorn. I rudely left him behind while he had his chariot removed." "Very well," Pierce bows, and smiles as Gold Heart storms off. Gold Heart calls out your name and says, "You're coming with me." As much as you'd love to hang out with an enraged Gold Heart, the talk with Emperor Halberd seems too important to miss out on. Gold Heart did say she'd join you later, but then you'd have to face her wrath then for not listening. You stand there, weighing the decisions in your mind while Baron brings a hoof to his face and shakes his head. At least he's laughing. Let's hear Gold Heart out. We can get the gist of the meeting with Halberd later. Weeeell.. I don't think we can really refuse her request, since it was us who pushed her to this point. Luna can always give us the summary of what happened during the audience afterwards. at least she smiled at our joke.